Villa swimming pool between sea and Cevennes 30km, very quiet. Property 12: Villa swimming pool between sea and Cevennes 30km, very quiet. L'Oliveraie: a cottage for 4 people, a cottage for two. Property 16: L'Oliveraie: a cottage for 4 people, a cottage for two. Charming attic apartment decorated antique chic in a 19th century building. Property 21: Charming attic apartment decorated antique chic in a 19th century building. Property 39: Villa "lou simbèu"
A luxurious villa in a quiet environment, without vis-à-vis. Property 50: A luxurious villa in a quiet environment, without vis-à-vis. This unique oasis in LeCailar, a well-kept village in the heart of the camarque, is hard to capture in words, but appropriate adjectives may include: tranquil, timeless, complete, authentic, spacious. Once you close the yard gate, the property becomes its own world. We stayed for two weeks, with two familys and a total of 5 kids, ages 1 - 8. The house is big enough for everyone to spend time together or to find a quiet place. We made outings to Aigues Mortes, Pont du Gard, Montpellier, Arles, Ardece. Our favorite beach was Ste Marie de la Mer. We didn't mind the driving (30-50min to most places) as the whole area is quite scenic. We also enjoyed whole or half days at the house, using the pool and BBQing steaks and sausages from the 2 (!) butchers in the village. The Camarque has a tradition of raising bulls (and bull fighting), and the butchers' specialty is bull meat. We had one technical issue with the pool; Jean Yves was highly responsive in taking care of it, and communication was excellent. 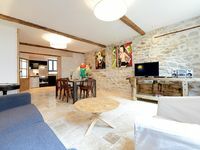 In summary, if you are looking for a big family vacation, you like cultural immersion, simple luxury, old stone buildings, and a place to retreat to, this house is for you - enjoy. The apartment is convenient to all of the sights. Very close to the Mason Carr&eacute;e, the market, and lots of shops. We easily walked to Les Jardins de la Fountaine, Ar&egrave;nes de N&icirc;mes and many restaurants. The apartment is pretty, clean and functionally furnished. It is perfect for 4 people and worked well for my family of five. The owner was accommodating for our late arrival and was easily reached by email or phone. Beware that many of the streets are pedestrian only, but GoogleMaps doesn't always know. It directed us down a street that was blocked and became so narrow we couldn't open the car doors and had to back out. The apartment is on a short pedestrian alley off a drivable road. There is very little street parking, so plan on using one of the parking garages if you have a car.